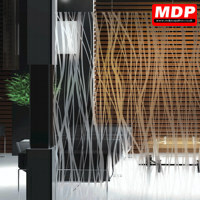 Our range of interior design films takes the designer look to a whole new level. 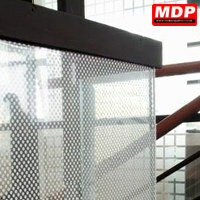 Extremely easy to apply these film have a 12-15 year interior durability. 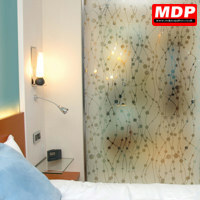 Available in a range of 16 different styles and effects there is a design to suit any environment. All films are 60 inch / 1524mm wide and are sold by the running metre. 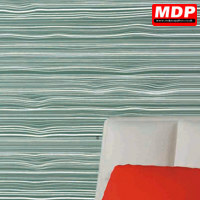 Pricing is for 1524mm wide per metre.You can get the quantity discounts by mixing any of the colours in this range. Etched film with water reed pattern. 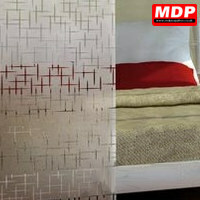 Etched film with flowing bead design. 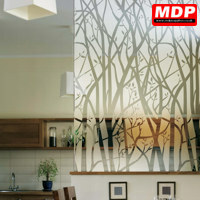 Etched film with tree branch design. 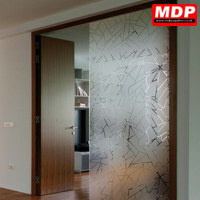 Etched film with geometric jagged ice design. Etched film with crossed linepattern. 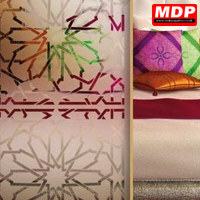 Etched film with arabian style pattern. Etched film with small stripes that decrease in width. 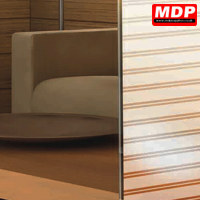 Combine with the Large Stripe Decreasing Film (below) for a fantastic effect on large glass panels etc. Etched film with large stripes that decrease in width. 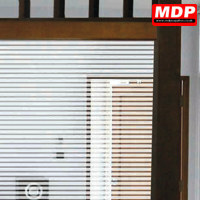 Combine with the Small Stripe Decreasing Film (above) for a fantastic effect on large glass panels etc. Etched film with 45mm stripes seperated by a 10mm gap. 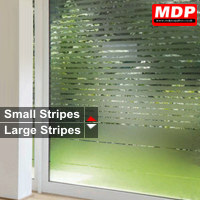 Etched effect film with 13mm wide stripes with a 6mm clear gap between them. 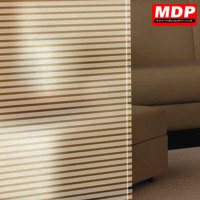 Etched effect film with two different height stripes. 13mm and 3mm wide stripes with a 3mm clear gap between them. Central large stripe with deceasing widths of stripes above and below. 13mm white stripes with 6mm clear seperation. The stripes on this film are white, not etched. Etched film with a 20mm squares spaced every 50mm. Etched film with a cube grid of nine 1cm squares. Each cube grid is 4cm x 4cm. Etched film with a grid of squares, each square is 45mm. Etched film with wave effect. 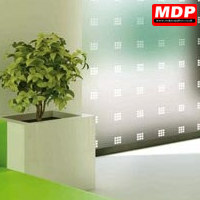 Etched film with a retro square with curved corner design. 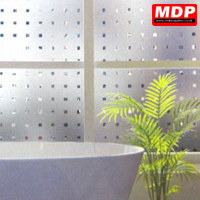 Window film with 3mm white dots. 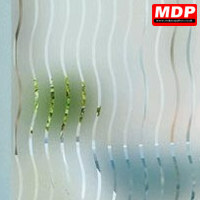 Window film with a cotton fibre effect. Random pattern of sound waves. The waves on this film are white, not etched.